As most of you know, I'm a big fan of Pioneer Woman. She is currently on her "Griswold Family" Book Tour and for some crazy reason, she is not coming to the Detroit area (go figure?). The closest she is getting to Detroit is Chicago and that event is happening...tomorrow. So, as you can guess, I won't be there. What to do....what to do? PW is visiting the Mall of America in Minneapolis on Saturday, November 21 and I've got 4 wonderful, beautiful and talented cousins who live in and around Minneapolis. Maybe one of them could help. Riding to my rescue is my cousin Lori. 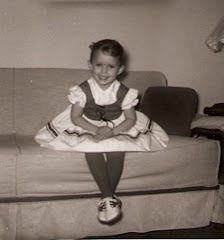 For those of you who have traveled to the bottom of my blog page and found that picture of the adorable little girl...that is Lori. Besides being my champion, she is also the originator of the term Mush-Push. With camera and cookbook in hand, my sweet cousin will be braving the crowds at the MOA (which is crazy naturally and probably a bit crazier with Ree in the house) to get me an autograph and hopefully pictures that I will be sharing with you. A big, giant THANK YOU to Lori for so generously volunteering to help me. I love you bunches. I seriously hope the line isn't as crazy as it was at The WalMart. Be sure to share with us every single one of Ree's recipes that you make or taste. I'm very interested. I've never read one that didn't sound good to me. Ask Lori if she can also get Brett Favre's autograph since she's already in Minneapolis. Kim...It should get there on Monday. Just in time to make something great for Thanksgiving. Donna...Hmm, we'll have to work on that Brett connection. That would be a great gift for my son-in-law. Jay loves Brett and Krissy loves the Vikes, so they are finally rooting for the same team...sort of. I am so excited for you! I look forward to the pics your dear cousin snaps. Here I thought you were going to get to go to the Mall! I went there once, some years ago and would sure love another trip. Fun on the autograph though. I wish Lori luck, Lindalou! I just returned today, thrilled to meet & hug my cooking guru, delightful Julee Rosso (Silver Palate Cookbook, Silver Palate Good Times, Great Good Food, Fresh Start, The New Basics). We stayed at her fabulous Bed & Breakfast, The Wickwood Country Inn in quaint Saugatuck (a must if you've never been there). Joey - I've not heard of The Wickwood Country Inn. This sounds like something I need to remember. Would be a great week-end get-away. I'm getting hungry just thinking about it.